Today I welcomed Real Estate Broker Owners Martha Viveros and Jim McPeak. Martha specializes in representing buyers and sellers in the Latin community and spoke of how she grew in business through a past failed business. We spoke of the importance of branding and she has branded herself La Diva of Real Estate and you can learn more about Martha at http://www.ladivaofrealestate.com or by phone at 813-385-7574. Jim McPeak joined me in studio today for his first on air appearance as an Expert Contributor to the show. Jim is a Military Veteran and very accomplished and experienced Real Estate broker. HIs firm specializes in property management and also new home buyer representation. 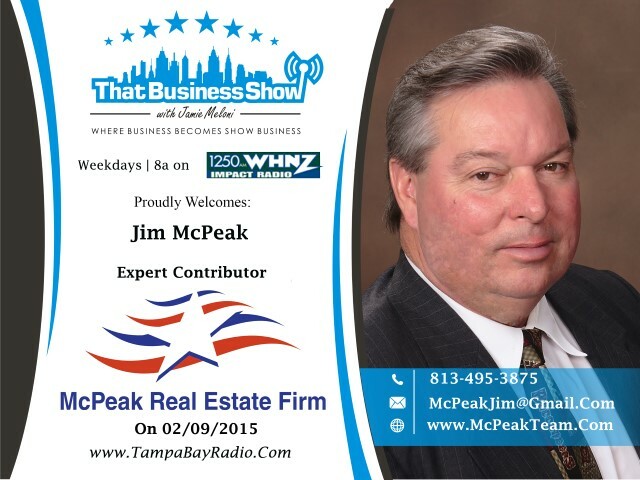 Reach out to Jim via phone at 813-495-3875 or website at http://www.mcpeakteam.com.